Within SELinux an object is a resource such as files, sockets, pipes or network interfaces that are accessed via processes (also known as subjects). These objects are classified according to the resource they provide with access permissions relevant to their purpose (e.g. read, receive and write), and assigned a security context as described in the following sections. Each object consists of a class identifier that defines its purpose (e.g. file, socket) along with a set of permissions that describe what services the object can handle (read, write, send etc.). When an object is instantiated it will be allocated a name (e.g. a file could be called config or a socket my_connection) and a security context (e.g. system_u:object_r:selinux_config_t) as shown in the Object Class 'file' and permissions diagram. The objective of the policy is to enable the user of the object (the subject) access to the minimum permissions needed to complete the task (i.e. do not allow write permission if only reading information). These object classes and their associated permissions are built into the GNU / Linux kernel and user space object managers by developers and are therefore not generally updated by policy writers. The object classes consist of kernel object classes (for handling files, sockets etc.) plus userspace object classes for userspace object managers (for services such as X-Windows or dbus). The number of object classes and their permissions can vary depending on the features configured in the GNU / Linux release. All the known object classes and permissions are described in Object Classes and Permissions. 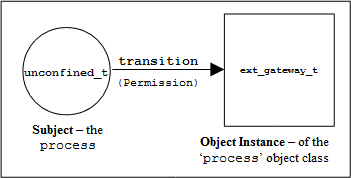 How a process is given permission to use an objects resource. By using the 'process' object class, show that a process can be described as a process or object. An SELinux policy contains many rules and statements, the majority of which are allow rules that (simply) allows processes to be given access permissions to an objects resources. allow The SELinux language allow rule. <tt>unconfined_t The source domain (or subject) identifier - in this case the shell that wants to exec the gateway application. ext_gateway_t The target object identifier - the object instance of the gateway application process. process The target object class - the process object class. transition The permission granted to the source domain on the targets object - in this case the unconfined_t domain has transition permission on the ext_gateway_t process object. It should be noted that there is more to a domain transition than described above, for a more detailed explanation, see the Domain Transition section. Inherit their labels from the parent process or object. The policy type, role and range transition statements allow a different label to be assigned as discussed in the Domain and Object Transitions section. SELinux-aware applications can enforce a new label (with the policies approval of course) using the libselinux API functions. An object manager (OM) can enforce a default label that can either be built into the OM or obtained via a configuration file (such as X-Windows). Use an ' initial security identifier' (or initial SID). These are defined in all base and monolithic policies and are used to either set an initial context during the boot process, or if an object requires a default (i.e. the object does not already have a valid context). The Computing Security Contexts section gives detail on how some of the kernel based objects are computed. The SELinux policy language supports object labeling statements for file and network services that are defined in the File System Labeling Statements and Network Labeling Statements sections. An overview of the process required for labeling file systems that use extended attributes (such as ext3 and ext4) is discussed in the Labeling Extended Attribute Filesystems section. The fs_use_xattr statement within the policy to identify what file systems use extended attributes. This statement is used to inform the security server how to label the filesystem. A 'file contexts' file that defines what the initial contexts should be for each file and directory within the filesystem. The format of this file is described in the modules/active/file_contexts.template File section. A method to initialise the filesystem with these extended attributes. This is achieved by SELinux utilities such as fixfiles(8) and setfiles(8). There are also commands such as chcon(1), restorecon(8) and restorecond(8) that can be used to relabel files. # 'myfile' is the file name. # The security context (or label) held for the file is displayed. copy a file - takes on label of new directory unless the -Z option is used. move a file - retains the label of the file. However, if the restorecond daemon is running and the restorecond.conf file is correctly configured, then other security contexts can be associated to the file as it is moved or copied (provided it is a valid context and specified in the file_contexts file). # The target directory (/usr/message_queue/in_queue) is label "in_queue_t". This is because the restorecond process will set the contexts defined in the file_contexts file to the context specified as it is created in the new directory. On a running GNU / Linux system, processes inherit the security context of the parent process. If the new process being spawned has permission to change its context, then a 'type transition' is allowed that is discussed in the Domain Transition section. user, role and type statements. As GNU / Linux runs it creates instances of objects and manages the information they contain (read, write, modify etc.) under the control of processes, and at some stage these objects may be deleted or released allowing the resource (such as memory blocks and disk space) to be available for reuse. GNU / Linux handles object reuse by ensuring that when a resource is re-allocated it is cleared. This means that when a process releases an object instance (e.g. release allocated memory back to the pool, delete a directory entry or file), there may be information left behind that could prove useful if harvested. If this should be an issue, then the process itself should clear or shred the information before releasing the object (which can be difficult in some cases unless the source code is available). ↑ Also known in SELinux as Access Vectors (AV). ↑ These file systems store the security context in an attribute associated with the file. ↑ Note that this file contains the contexts of all files in all extended attribute filesystems for the policy. However within a modular policy each module describes its own file context information, that is then used to build this file. This page was last modified on 25 September 2015, at 13:36. This page has been accessed 83,922 times.